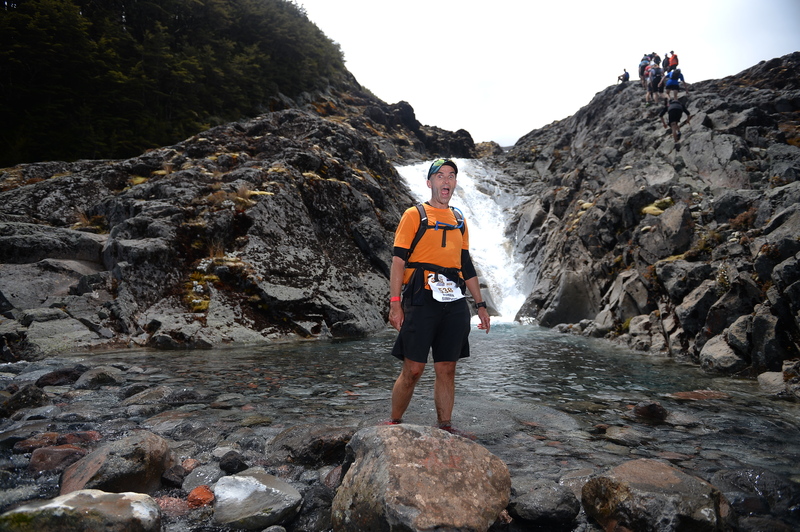 This weekend I raced The Goat, which is a ~20km mountain run from Whakapapa to Turoa, along the western slopes of Mount Ruapehu. It’s a beautiful but brutal course – a lot more scrambling, scree, and rock climbing and a lot less packed trail than I had mentally prepared for. I managed to get around with only one face plant and tagged knee. The last 5km climbs from 1233m at Mangaturuturu Hut to 1624m at the ski field finish, including the final 2km “mamas mile” up the road, by which point everybody was looking pretty broken. If you look closely you can see there is one small spot on my shirt which isn’t soaked in sweat. It took me a while to work out this is just the thick part of my heart rate monitor strap. It’s a great event, and I throughly recommend it to you. There are only 600 places available each year, so keep an eye out for registration for the 2015 race soon! 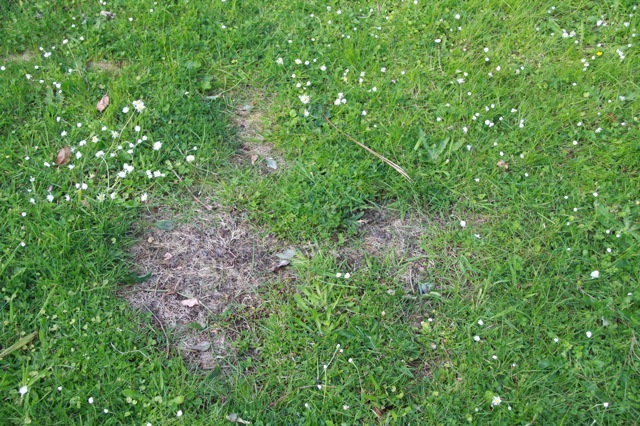 As a result we now have a dead patch in the grass. Something to think about next time you order a skinny drink. Just over a year ago I started using an iPhone app called Fat Watch to track my weight and body fat percentage every day. It’s had a big effect. It was, at the time and still, the most expensive app I’ve purchased for my iPhone, at NZ$13.99 (since then the price has dropped to $9.99), but still good value I think. Between 2001, when I peaked at 106kg, and 2004, when I returned to NZ from the UK, I lost about 25kg. Mostly this was a result of eating less crappy food, but also by being more active. 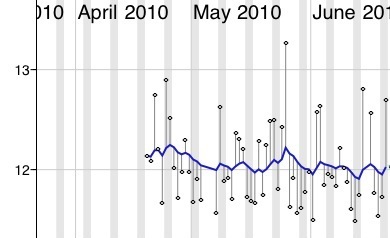 In the five years following I more-or-less maintained my weight at between 82kg and 85kg, although during that time I started to train more consistently for cycling and triathlon and in the process shifted my body composition quite a bit, from ~23.5% body fat to just over 20% body fat. To be honest, I was focussed more on my aerobic fitness than on my weight. We didn’t even own scales, although I did weigh myself from time to time at the gym. I mostly measured my progress using the belt on my trousers. I thought I’d pretty much lost as much as I was going to and was confident that I wouldn’t fall back into old bad habits and put it back on. However, despite all of the good things I was doing there was a persistent amount of body fat that I just couldn’t shake, especially on my upper body. 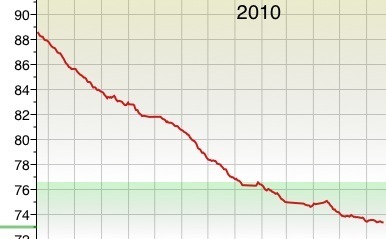 Then at the start of 2009 I broke out of the top end of this weight band, so I decided it was time to start paying more attention and seeing what changes I could make. When I first installed the app and weighed myself in May 2009 I was 88.6kg. My first goal was to get back to 80kg. Even when I was running fit in London I never got below this level. I guess I assumed that this was my asymptotic limit. I was wrong. Since I started measuring, as the graph below shows, I’ve lost about 15kg, and skipped right through the 80kg barrier. As I type I’m about 73.5kg. The red line is a moving average of daily measurements, taken at approximately the same time each day using the approach described in The Hackers’ Diet. You can see there have been a few flat points, which all correspond to times when I’ve been traveling. But, in general, it has fallen reasonably steadily during this time. The green shaded area is the “normal” range based on the BMI scale. I remember calculating this when I weighed ~90kg and thinking it was absurd to think that 76.5kg was my target weight. I’ve now been comfortably below that level for a few months. When you aggregate these changes over a long period of time they seem quite big, but actually they are small. Over the last 12 months I’ve lost about 0.25kg per week. If you do the maths (or let the app do it for you!) on average I have been burning ~277 calories per day more than I have consumed – less than one Moro Bar – not such a big sacrifice when you compare it to the positive effect that it has had. In physics they talk about an Observer Effect – that is, when you observe something you will change it. This is how I think of these changes. It’s all about creating a feedback loop between what you do (inputs) and the effect it has on you (outputs); creating a game that you win by following the behaviours that you want; and getting a much better understanding of the impact of all of the little decisions you make. If you eat an unnecessarily big lunch and weigh yourself a couple of weeks later it will be difficult to create a cause and effect relationship, but when you weigh yourself the next day and can compare that to previous days and see the increase immediately then you can start to work out what not to do. Or, perhaps even more importantly, if you know that you’re going to weigh yourself the next morning and be disappointed in the results then perhaps you choose a better option from the menu or eat a smaller portion in the first place. When you measure your weight every day you also get to see how much it jumps around of its own accord. This graph from the last three months shows the daily readings in black. Again, the red line is a moving average. You can see there are many days when I was 1kg or more above or below the trend line. There is generally an explanation – too many snacks or not getting enough sleep (bad) or a long bike ride or hard session at the gym (good). 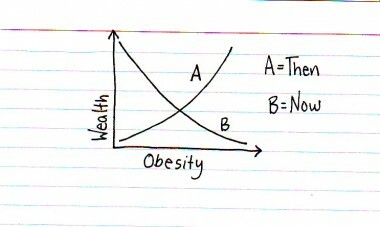 There is only one way to learn about all of these different factors. You also see the importance of taking regular and consistent measurements, so as not to be unnecessarily disappointed or unrealistically encouraged by a single reading in isolation. In mid-April there was an updated version of the app released which added tracking for body fat percentages. This can be difficult to measure accurately using scales, but again using regular measurements and a moving average you will at least get a sense of the trend. 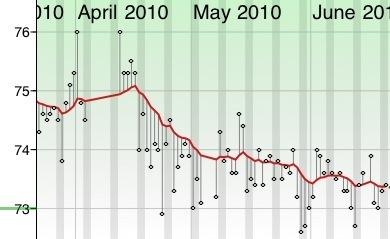 This graph shows my total body fat measurement over the same period. According to ACE an “ideal” range for a fit male is between 14% and 17% (at the moment between 10.3kg and 12.5kg for me), so I’m now in that range, and probably only have at most ~2kg more to lose. What am I going to obsess about then, I wonder? 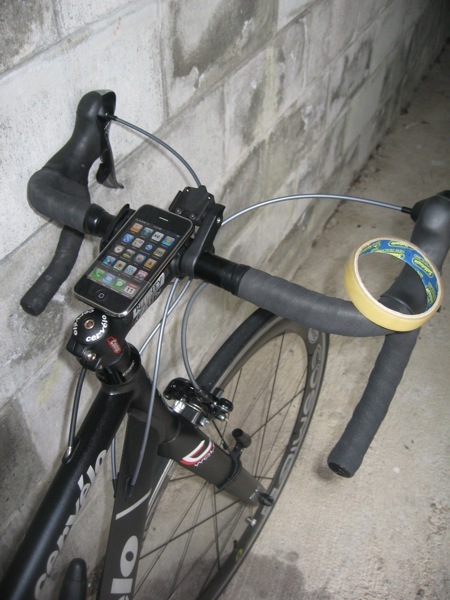 This is a bit of a gimmick – but still an interesting concept. If you’re trying to reduce the portions you eat then one easy solution is a smaller plate. An excellent series of posts. If the hassle of data entry is the main thing stopping you from tracking your weight then perhaps you’re lacking some of the core motivation required to sustain something like this, however, this is nifty technology. This is probably a lot more than you wanted to know about muscle. I recommend you try the knee life experiment he talks about – a useful reminder that your body is something you can maipulate. 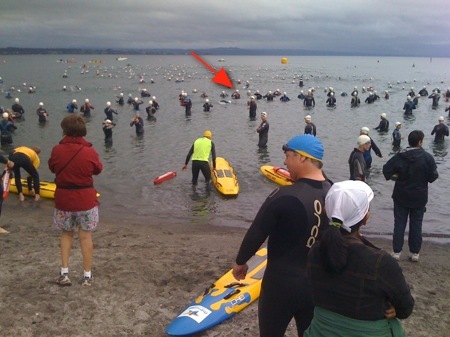 Some of you may remember a post from earlier this year, Start != Finish, where I wrote about my experience of the Tauranga Half Ironman in 2008. Trying to avoid making those mistakes again, my goals for this race were mostly related to the shape I wanted to be in at the start line rather than the time recorded at the finish. That seemed to work out for me both ways – I’ve lost some more weight and I’m as fit as I’ve ever been and feeling quite positive about that, and (as a result?) 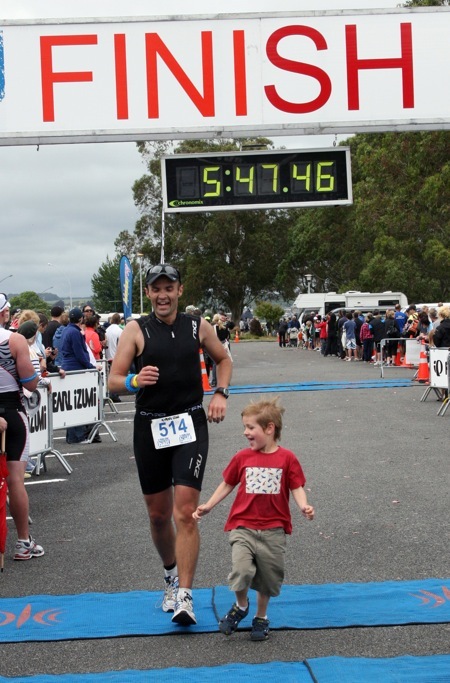 I smashed my personal best time for that distance by nearly 30 mins, finishing in an official time of 5:47.50. In case that sounds fast, I should point out that this put in me in 205th place on the day, over 90 mins behind the winner. One of the good things about triathlon as a sport, and these sort of events specifically, is that you can race yourself and win. I know that entering long races seems like madness to most people, but really they are just an excellent excuse to be active, eat well, push myself, etc. I’ve found committing to an imminent race date to be just enough motivation to tip the balance in my favour on all of those fronts. 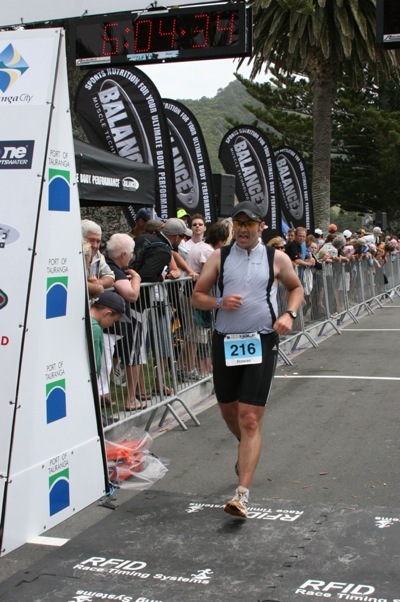 However, I’d like to specifically recognise the anonymous person who unkindly commented on the size of my belly when I posted my finish line photo from Tauranga. You didn’t, and probably wouldn’t, say it to my face. Thing is, there really is nowhere to hide in those lycra race tops, as you could easily discover for yourself. But, anyway, thank you. To quote Michael Jordan’s acceptance speech when he was inducted in the Basketball Hall of Fame earlier this year: “You put another log on the fire”. So, with this race done I’m on the lookout for another challenge. Ideally this time it will be something that doesn’t involve swimming, cycling and running a long way, only to end up where I started. Any suggestions? Like many of you, I’m sure, I’m enjoying following the adventures of Vaughan Rowsell, who is now more than two weeks into his attempt to ride the full length of New Zealand “uphill” (i.e. starting at the bottom and finishing at the top). He also has some route maps on his site. What make this so exciting? Just that he’s doing it. In other words: what sounds impossible is actually quite achievable, which is not to say easy. The only thing that makes him different from you (and me!) is that he has managed to bridge that massive gap between thinking about doing something great and actually making it happen. It certainly beats sitting on the couch feeling fat and lazy and generally sorry for yourself. He’s a pretty unassuming guy who deserves all of the credit and support that I hope he gets (en route he is raising money for The Agency for Spinal Concern). I don’t know if he is thinking this far ahead yet … possibly only when it gets really hard grinding up a big hill or into a headwind in the rain … but the feeling he’ll have when he gets to the end is going to be crazy awesome. I’m really looking forward to spending a day riding with him when he gets to Wellington. Maybe two, if he’ll have me? I rode with Vaughan from Wellington to Otaki. It was a cold wet day, and the route we took over the Akatarawas was pretty brutal, but it was fun anyway. His blog has some details. Since then he has continued on up the country and is now into the final week or so of his ride. 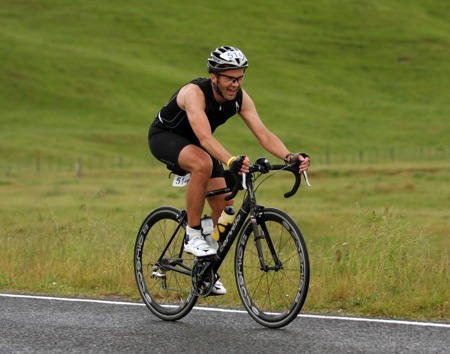 If you are in the Auckland area get out this weekend and support him as he rides across the bridge. And, where ever you are, you can support his charity by donating through his page on Give A Little.